On the eve of Wimbledon last year, rising British star Katie Boulter said she was in no hurry to get into a relationship. “I’m completely focused on my work right now and that’s it. Maybe one day [I” have a boyfriend] after I retire, hopefully,” Boulter, then ranked No. 239 in WTA rankings, said. One year on – following her second-round run at the Championships this season – she seems to have found her love in fellow tennis player Jack Sock of the USA. 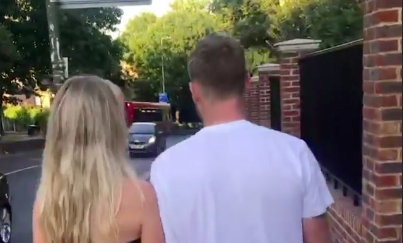 Boulter (21) and Sock (25) walked hand-in-hand, as can be seen in an Instagram video posted by the latter’s compatriot Mike Bryan, with whom he won the doubles title at the All England Club over the weekend. “Double date,” Bryan wrote as he enjoyed a stroll in the company of his girlfriend, model Nadia Murgasova. To add to the rumours, Sock enjoyed lunch and watched an episode of Love Island with Boulter in what appears to be a hotel room. He later posted a ‘story’ on his official Instagram account too. For those unaware, Sock previously dated Michala Burns for quite some time, and it’s not known as to when and why the duo parted ways (if they actually did). He was also rumoured to be dating fellow American star Sloane Stephens, although the duo never confirmed the same.